The Circus House: A Christmas Wreath Doesn't Smell Like Beef- Or does it? A Christmas Wreath Doesn't Smell Like Beef- Or does it? The house is finally quiet. My mom's house that is. Christmas holidays are supposed to be a time to re-energize, re-connect with friends and family and spend quality time with your darling children. Right now all I can think about is how much longer until it is over. In the past two weeks I have consumed enough calories to sustain an entire football team and I have done exactly six minutes of exercise at the local skating rink. Which will inevitably lead to New Year depression and a early January meltdown including gym memberships and Weight Watchers. Four of the five children puked the week of Christmas, two of them at their Grandparent's house. One in the middle of Christmas Eve on the living room rug during a festive game of "telephone" where one person whispers a message and then they whisper to the next person. The special Christmas message my niece came up with was " A Christmas wreath doesn't smell like beef". She was literally mid whisper with Kelsey when in the middle of 18 people and to my complete dismay he barfed up what can only be described as a Christmas eve concoction of lasagna, birthday cake, chocolate milk and half of the goodie table. 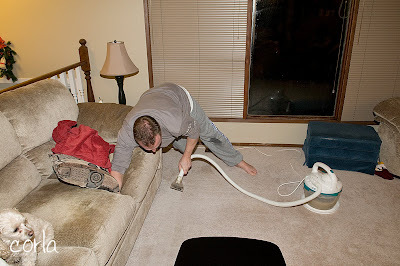 Maybe if I had the forethought to have video taped the event I would be $10 000.00 richer but unfortunately the only evidence I have is this picture of my husband steam cleaning the carpet. Somehow even when he is cleaning up puke I still think he is cute. Their poor rug! Some day I will tell you the story about how I melted their brand new linoleum. All this and they still love me and our family! I am pretty lucky to have such great in laws. Not only do we have the stress of packing up seven puking fighting people into two vehicles, with a dog, and a million presents the roads were also the worst I have ever had to drive on. I felt like I was in labour for most of the four hour drive. I was using my Lamaze breathing down icy hills, through drifting, swirling snow in the passing lane that was four feet deep, behind white semi trailers who wanted desperately to pass me even though I pleaded "please don't pass, please don't pass". We stopped half way for a lunch break and it took us 45 minutes just to drive through the city. I was so glad to for the break in driving but all I could think after we ate a $65 lunch was that no one better puke up that expensive of a lunch. There are about 100 more texts like that but I realize reading them now it sounds exactly like when we are in the same vehicle, me telling him to slow down and him telling me to relax it will all be fine. He is my rock! I am trying really hard to appreciate everything in my life. To love spending time with my nieces and nephews that seem to grow a foot between visits. To make the time to enjoy being with my children but why is it so hard? Pat's mom and dad and my mom did so much work to get ready for the holidays. The open their arms to us puke, chaos and all. When my kids look back on this Christmas will they remember the puking, bad roads, and majorly frazzled mother? I hope what they remember will be all the love they have and that "A Christmas wreath doesn't smell like Beef!" What's your Christmas holiday experience? Does your travelling go smoothly or is it just me? This christmas, it was my turn to barf all of christmas, boxing day and a few extra days for good measure. My morning sickness and eating sugar sweets was my doom. It seems like every christmas, someone in my family barfs..this year it was my turn.